Home of the Philadelphia Eagles for just over a decade, Franklin Field is the answer to a trivia question that even the most dedicated NFL fans might not know. It is the oldest football stadium in the country. In 1895, a simple wooden stadium was constructed just outside Philadelphia on the campus of the University of Pennsylvania. When it opened in 1895, at a cost of only $100,000 it was the first stadium in the nation to have a scoreboard. For over 20 years Franklin Field remained the same and underwent few changes. However, in 1922 drastic changes took place and the stadium was transformed into a larger more modern structure. The wooden grandstands were demolished and replaced with concrete stands. Three years later, the upper deck was added to Franklin Field. For decades, the stadium has been used for the UPenn’s football games. Until 1958, the Philadelphia Eagles had played at numerous stadiums around the city, the most recent being Shibe Park, a baseball stadium. After the 1957 season, the Eagles moved to Franklin Field, playing their first game at the stadium in September 1958. Upon moving into Franklin Field the Eagles doubled their attendance. For 13 seasons the Eagles played here, including playing in the 1960 NFL Championship Game. The Eagles played their last game against the Pittsburgh Steelers at Franklin Field on December 20, 1970. The following season, they moved into Veterans Stadium. 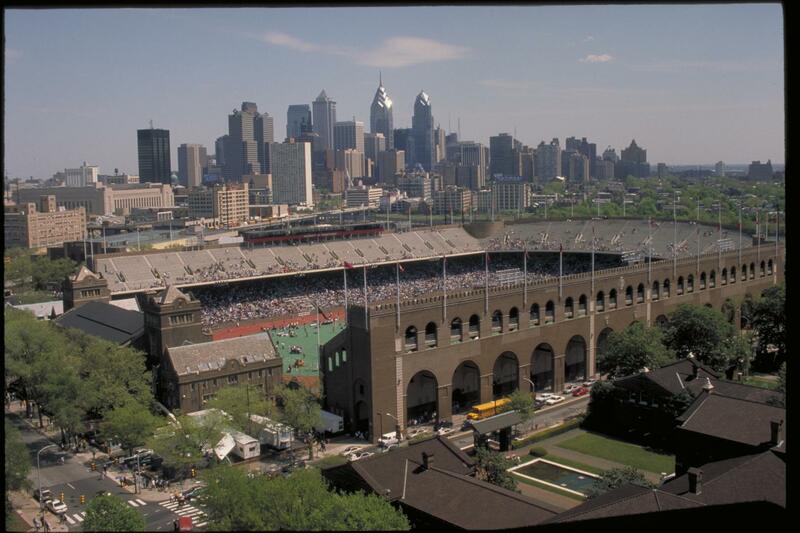 Today, Franklin Field is the home of the University of Pennsylvania’s football, lacrosse and track teams. It is the oldest stadium used for college sports.